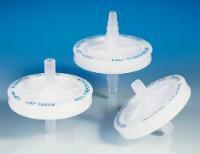 Reusable, in-line filters with 50mm hydrophobic PTFE membranes in polypropylene housing. Large surface area provides greater throughput. Ideal for venting bioreactors, fermentation tanks, and carboys. Also for filtration of aggressive solvents and sterile gas purging of culture vessels. Stepped hose-barb connectors fit 6.4–12.7mm (1/4–1/2") I.D. tubing. Autoclavable at 121°C (250°F) for 30 minutes.